Cut Your Payments In HALF? I've ranted about this before, but lately I've heard a lot of ads on the radio saying how great these loans are, so I thought I'd revisit. The article from the Dallas Fed I posted about yesterday also had an eye opening chart highlighting these type of mortgages. I'll get to that too. Many of the loans being pushed on the radio offer to cut your payments in half, or push low interest rates. They are called toxic mortgages, suicide loans, and nightmare mortgages because they allow a borrow the option to not repay the full principle and interest on the loan. They also usually carry severe prepayment penalties. So what happens when you take the so called option, and pay only the interest (or less than the full interest due) on the loan? In some cases, the difference gets tacked onto the loan's principle balance. That's called negative amortization. Your principle isn't going down, it's GROWING. Here's a really basic example. Let's say you have a 300,000 mortgage, 30 year fixed, at 6.5%. Your payment (excluding taxes and insurance) would come to $1,896. Remember, the payment has two components, principle and interest. If this is your first payment, the interest accounts for $1,625 and the remaining $271 is applied to principle reduction. Your principle balance is now $300,000 minus $271, or $299,729. Now let's say you choose a loan that gives you the option to pay only interest. With some programs, your payment would be $1,625 and the remaining $271 gets tacked onto your loan balance. Many have a balloon payment in 5 or 7 years but you hope to refinance before that time or sell (if the market was good to you). That's a plain vanilla interest only loan. Interest only loans are risky, but let's move on to truly toxic mortgages. Let's say you choose a mortgage that "gives" you the option to pay even less than the interest due. For sake of the example, let's assume you choose the option to pay only $1,400. Now, the remaining $491 is tacked onto your principle balance (depending on your loan program) and each month, the principle balance grows. In other words, your loan doesn't reduce over time it goes up. Obviously, it can't increase infinitely, so at a specified point a condition of the loan is triggered and you no longer have the option to pay less than full principle and interest. And you're paying on the new principle balance, not the original 300,000. What does it look like when people run out of options and have to pay the full principle and interest on the new loan balance? For some it means their monthly payment is going to go up 40% or even more. Search around on the net and you'll find the horror stories. When these people get smacked with this kind of increase, they'll probably want to sell and get out. But it's not easy to sell in a slow market, and the home might not have appreciated as expected. A borrower could even owe more than the house is worth, i.e. upside down. Even if the home did appreciate, there are massive loan prepayment penalties, closing costs, realtor fees, and more. The odds are not good and the home will probably end up in foreclosure. Frankly, I think these loans are nearly criminal because most borrowers do not fully understand what they are getting themselves into. The ads on the radio exclaim, "what a deal!" but they're wrong. It's not a deal, it's a sham. Here's some additional reading from Business Week on toxic mortgages. Let's get back to the Fed. In the Fed's Crystal Ball, there were a series of charts showing varying aspects of the health of real estate. Chart #5 in particular caught my eye and prompted this post. Below is a copy of which I've blown up from original size. (Yes, I know it's pixelated. As was the original). 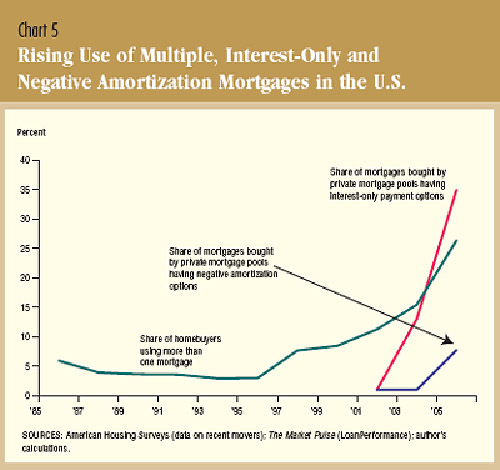 The chart is titled Rising Use of Multiple, Interest-Only, and Negative Amortization Mortgages in the U.S. The long GREEN line says "Share of Homebuyers using more than one mortgage." These are piggy back mortgages. At first, the line is steady/slightly declining. It was around 5% in 1986 and dropped to about 3% by 1996. Then in the middle of '96, it begins a sustained upward trend to about 15%. In 2003, it explodes and as of 2005 accounted for over 25% of all mortgages issued. In 2002, the chart begins to track loans with interest only payment options (RED) and with negative amortization options (BLUE). By 2005, interest only (i/o) loans appear to have accounted for 35% of mortgage originations and negative amortization loans accounted for about 7%. Piggybacks 25% + I/O 35% + Negative am 7% = Total 67%. So 67% of new loans nationwide in 2005 were non traditional, higher risk mortgages. Now that's an unstable economic situation . It's also probably the biggest reason we have so many foreclosures now in Colorado. So if you hear one of those ads on the radio, don't believe the hype. If you're in the market for a home loan, check the loan details carefully and do the math over the lifetime of the loan. Watch out for extra points, unnecessary fees, prepayment penalties, and even bait n' switch at the closing table. When you're shopping, be sure to work with reputable lenders and make sure they know they're competing against each other. You're more likely to get a good deal that way. We have a short list of lenders we refer people to. It's based on our experience and a lender's willingness to roll up their sleeves and work hard for our clients. It's constantly evolving based on our client's feedback and our evaluation of performance (in fact we're adding a name after yesterday's closing). If you're in the market for a loan, feel free to call us and we'll share our list with you. ph: 303.746.6896. 1. "...the remaining $271 gets tacked onto your loan balance." My understanding of interest-only loans was that you pay only the interest. The principal amount of a tradition PI payment doesn't get subtracted from the mortgage balance, but nothing new is "tacked on" either. So in the negative amortization example that follows, only $225 is "tacked on" to the loan balance. Still toxic, but it sounded like a "basic" interest-only loan had a growing principal as well, and I didn't think they did. 2. "Piggybacks 25% + I/O 35% + Negative am 7% = Total 67%." Strictly adding up the percentages is a little deceptive, because many first and/or second mortgages in a piggyback scenario can also be I/O, so straight addition won't give you an accurate number. I'm guessing the total of exotic mortgages, while still unnaturally high, is below 67 percent. I agree that "Neg Am" or "option ARM" loans are not good loans and should be considered toxic. And while I refuse to originate any "Neg am" loans for clients, I know they can be good loans in the right situation and for people understand how they work. I would disagree with your assessment of Piggyback and IO loans as toxic loans. Piggyback loans are a great tool for borrowers to avoid paying private mortgage insurance (PMI) and therefore, offering the borrower a lower overall payment and until recently providing them with greater tax incentive (borrower's with household income over $100,000 still are unable to deduct PMI). IO loans can also be great programs and the best options for investors and even first time home buyers that will have an increase in income in the next 5 years. However, it is the responsibility of the mortgage broker to discuss the risks and benefits of these loans and help the borrower understand all aspects of any loan their considering.